The average American consumes 183 pounds of fresh vegetables and 128 pounds of fresh fruit each year. A good portion of what we consume annually is harvested right here in the States. According to the latest numbers, we produce close to 190 billion pounds of fruits and vegetables each year. Fruits and vegetables require a wide variety of belting to get them from the farmer's field to food processors, as well as the shelves of our local supermarket. 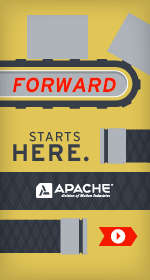 Apache carries them all — from flat and cleated belting for harvesting equipment to belting for sorting, washing, packaging, cutting, chopping, and even packaging. Additional applications range from stemming, washing, and dewatering, to hand sorting the fruits and vegetables. Contact the experts at Apache to discuss more belting options available for fruits and vegetables.